Biomanufacturing facilities that are designed and built today are radically different than in the past. The vital information and knowledge needed to design and construct these increasingly sophisticated biopharmaceutical manufacturing facilities is difficult to find in published literature—and it’s rarely taught in architecture or design schools. This is the first book for architects and designers that fills this void. Process Architecture in Biomanufacturing Facility Design provides information on design principles of biopharmaceutical manufacturing facilities that support emerging innovative processes and technologies, use state-of-the-art equipment, are energy efficient and sustainable, and meet regulatory requirements. 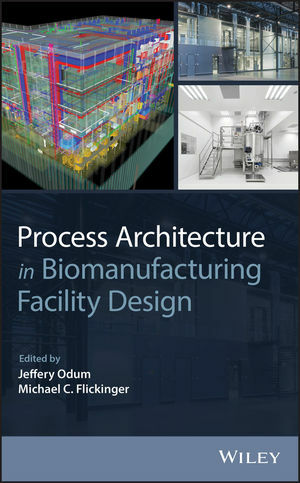 Relying on their many years of hands-on design and operations experience, the authors emphasize concepts and practical approaches toward design, construction, and operation of biomanufacturing facilities, including product-process-facility relationships, closed systems and single use equipment, aseptic manufacturing considerations, design of biocontainment facility and process based laboratory, and sustainability considerations, as well as an outlook on the facility of the future. Process Architecture in Biomanufacturing Facility Design is an ideal text for professionals involved in the design of facilities for manufacturing of biopharmaceuticals and vaccines, biotechnology, and life-science industry, including architects and designers of industrial facilities, construction, equipment vendors, and mechanical engineers. It is also recommended for university instructors, advanced undergraduates, and graduate students in architecture, industrial engineering, mechanical engineering, industrial design, and industrial interior design. Jeffery Odum, CPIP is the Managing Partner of the Strategic Manufacturing Concept Group, and a Global Technology Partner at NNE in the US Office located in Durham, North Carolina and a Teaching Fellow in the BTEC program at North Carolina State University. Michael C. Flickinger, PhD is the Associate Director for Academic Programs at the Golden LEAF Biomanufacturing Training and Education Center (BTEC) and a Professor of Chemical and Biomolecular Engineering at North Carolina State University, Raleigh, North Carolina.